My favorite part about summertime is quiet Sunday mornings spent at the small farmer’s market in my town. It’s usually less crowded, a lot less hot, and the produce is much less picked over earlier in the morning. Plus, it gives me time to wander around and decided what I am going to buy (instead of buying everything and anything I lay my eyes on). Just me, the fruits/vegetables, and my thoughts… summertime bliss! I usually go to the market without a plan and then make meals from whatever looks good that day, but yesterday, I had a specific goal: buying peaches or nectarines to make Peach/Nectarine and Blueberry Crumble. My social media pages have been EXPLODING with this amazing combination of sweet and slightly tart fruit with a yummy topping – photos of crumbles, pies, cobblers, and slab pies inspiring me to go out and buy all the ingredients to make my own dessert creation! So I settled with making a crumble that had peaches AND nectarines, perfectly sweet/tart blueberries, a hint of lemon, and a delightful oat topping. Yep, pretty much summertime in a pie dish. 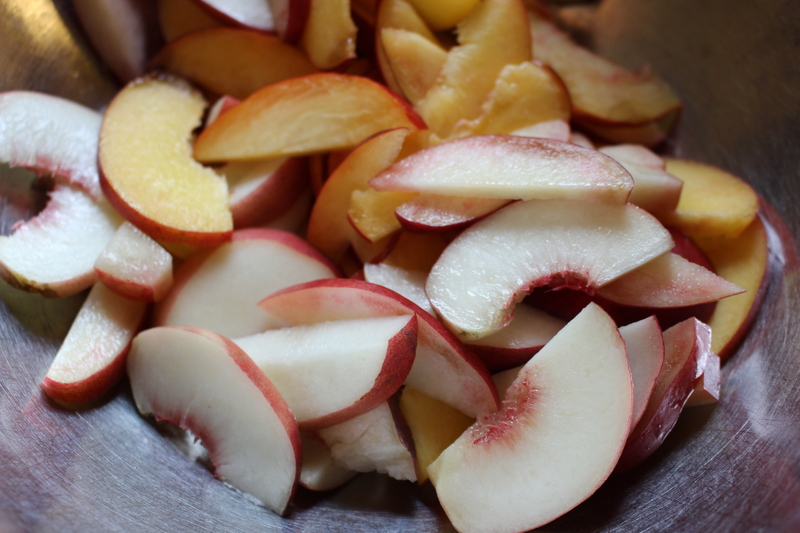 It all starts with a combo of peaches and nectarines that have been washed, halved, and sliced into thin strips. You technically can use all nectarines or all peaches, all white-fleshed fruit or all yellow-fleshed fruit, or you can be like me and grab a little bit of everything (white nectarines, yellow nectarines, and white peaches)! I don’t peel my peaches/nectarines because I don’t like peeling peaches/nectarines but also because it adds a bit of fiber to the dessert (which makes it a little more healthy, right?). Then add in some blueberries! I love the color combination between the different fruits. Some flour, cornstarch, granulated sugar, ground cinnamon, ground nutmeg, lemon zest, and lemon juice are all you need for a perfectly thick filling with flavors that make the fruit taste like the best version of themselves. Toss it all around until all the fruit is coated. And pour into a greased pie dish (this one is about 9 inches in diameter). Then all that’s left is to make the crumble portion of this crumble! In the bowl of a stand mixer, toss in some flour, some oats, sugar, brown sugar, salt, ground cinnamon, and ground nutmeg. Beat with the paddle attachment until combined. Then you add in one stick of cold unsalted butter that has been cut into small cubes and beat the mixture until it forms crumbles of “dough” (hence why I think this is technically called a crumble and not a cobbler). Sprinkle the crumbles over the fruit. And bake at 375 degrees for 30-45 minutes until the top becomes brown and crisp and the fruit is bubbling. I served mine at room temperature with some vanilla bean ice cream (but whipped cream or plain is just as amazing!). Super simple, super yummy, and totally summer (what can be so bad about that?). Simply A (RD) Fact: Blueberries are nutrition powerhouses, packed with dietary fiber, vitamin C, and antioxidants. Preheat your oven to 375 degrees. Line a baking sheet with parchment paper and place your greased 9-inch pie dish on top of the baking sheet (for easy clean-up in case of spill-over). Set aside. In a large bowl, combine the fruit, flour, cornstarch, sugar, cinnamon, nutmeg, lemon zest, and lemon juice. Toss thoroughly to coat the fruit in the flour and spices. Pour the filling into the greased pie plate. In the bowl of a stand mixer, combine flour, oats, the sugars, cinnamon, nutmeg, and salt. Using the paddle attachment, mix the dry ingredients until thoroughly mixed. Add in the unsalted butter and continue to mix until soft crumbles form, about 1-2 minutes. Gently spread the crumbles over the fruit until the entire surface is covered. Bake the crumble for 30-45 minutes until the top becomes golden and crisp and the fruit is bubbling. Serve immediately or at room temperature with whipped cream, ice cream, or just by itself!